In stark contrast to this is Wadi Bani Khalid, one of Oman’s most beautiful wadis. The wadi has clear deep blue water and you will have an opportunity to take a refreshing dip in the spring water and relax under the shade of the palm trees. Catch a glimpse of the pretty villages of Wadi Bani Khalid which cling precariously to the rugged mountainside. It is advisable to wear light, comfortable clothing and walking shoes. Muscat-Wadi Bani Khalid-Wahiba Sands. 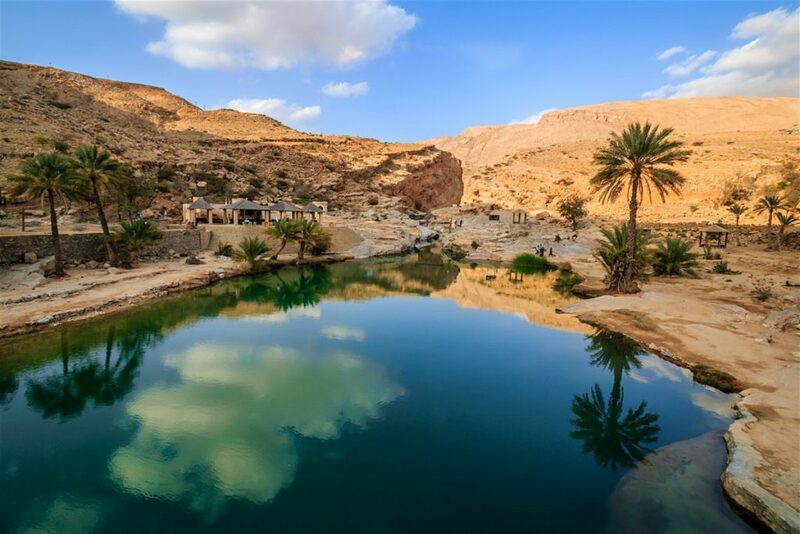 Drive across mountains and arid lands with breathtaking landscapes to one of Oman’s most beautiful wadis-Wadi Bani Khalid. The wadi gives you an opportunity to take a refreshing dip in the clear spring water and relax under the shade of the palm trees. Backtrack to the main road and head to the town of Al Mintrib, from where you will then drive to the Wahiba Sands. After a short drive you reach the 1000 Nights Camp where a welcome drink of Omani coffee “Kahwa” dates & fruits will be served and your guide will then drive you up a 200- meter sand dune to watch the sun set. BBQ dinner and overnight in traditional Bedouin tents. Wahiba Sands-Sur-Quriyat-Muscat. Your guide will take you for a round of spectacular dune drives before leaving the camp and heading to the fishing town of Sur famed for its dhow building yards . Take the dirt road to Qalhat – an ancient natural port town now in ruins. Today Qalhat is the gas port of Oman. View the Bibi Maryam mosque, now a UNESCO heritage monument. Take a stroll past the lush green estuaries of Wadi Tiwi and Wadi Shab, one of the more magnificent wadis of Oman . Drive along scenic mountainous roads until the white beaches of Finns and on reaching Quriyat take the tarmac highway to Muscat.